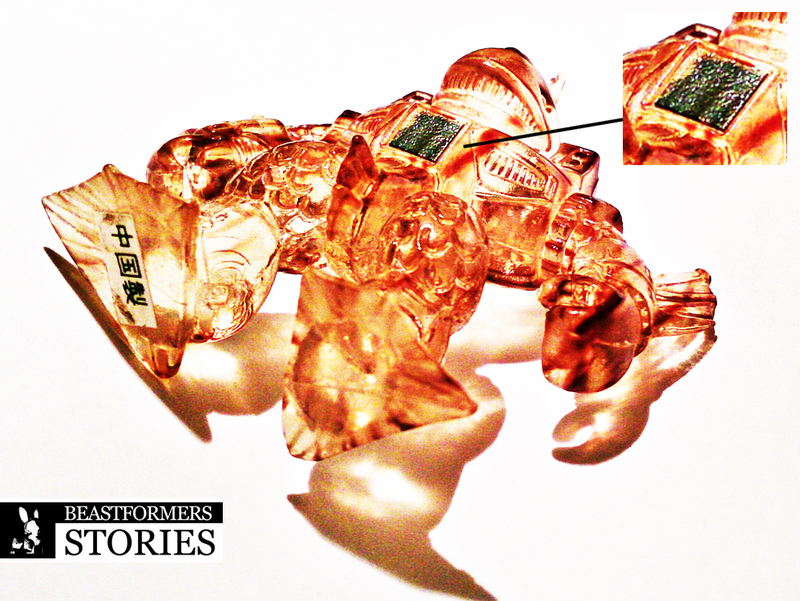 The origin of the Striped Clear Carp (one of the most rare figures in the Battle Beasts line) can be found in an accident caused by one of the employees of Takara in Japan back in the days…. During a lunch break a couple of co-workers decided to take one of the Clear Carp figures with them as a subject for discussion while enjoying their traditional Japanese bento. An as usual there was also a bowl with Soy Sauce out on the table. It is “unclear” how it happened but at a certain moment the Clear Carp ended up in the middle of the bowl with Soy Sauce. In an instant one of the co-workers reacted and took out the Carp figure with his chopsticks and held it above the bowl and let it drip for a few seconds. It was during these few seconds the co-workers looked at each other and one by one they started to smile. What they were seeing was a new figure for the Battle Beasts line, the Striped Clear Carp! Ok, I might have thickened and smoothened the original story a little bit but the idea is as “clear” as hilarious considering this as a true origin for the design of the Clear Striped Carp. And this was also my thought the moment I heard about this for the first time but despite the fact that there was no real info or value to this story it has always been around in the back of my mind. Until a specific issue arose recently and this strange thought was placed back on the table at an instant. That specific issue I decided to look into was in fact the result of a frustrating problem I had not been able to solve so far. A problem that showed itself AGAIN when a box with my new Clear Striped Carp showed up and as soon as I noticed it I could not held myself from swearing a few bad words. Because this figure ALSO had the, in my eyes, imperfect rub sign (the heath activated chest-sticker that each BB has) in which the whole square which is supposed to be black was not completely black. So I could not believe that with all my experience I was tricked again by a figure that had a, with black marker, repaired rub sign. This method is often used to cover up the absence of the black layer from the rub sign which is supposed to cover up the element (Wood, Water, Fire) of the Beast during those moments it is not rubbed or activated by heat. An issue that is for me personally as a perfectionist in collecting a big frustration for even every normal common BB figure let alone on such a rare figure. Unacceptable!! The stripes on the carps are applied after they have their stickers put on. At first I thought he was joking because that would not make any sense at all but he added a picture of his own figure and even though it was not very clear on that picture, since it is a very hard to capture detail, I decided to pull out my Striped Carp from the display and take a look. But it was already over midnight, as often when looking into these kind of strange things, so I was forced to use artificial lighting. The use of artificial light is something I always avoid when it comes to looking into specific details since there is nothing better than daylight. Most of the time, since in this particular case it turned out to be a little different because together with this artificial light and a little bit of movement with the figure my eye spotted something I could not believe………. Click on the image to see it in full detail. The Stripes that form the lines of the Striped Carp where clearly crossing OVER the rub sign. Unbelievable because this would not make any sense at all from a production point of view and knowing how TAKARA was right on top of their production line back in the days. The rare Stone Cobra was marbled and left without a sticker completely after all. I had to check this amongst some other collectors to be 100% sure about this interesting outcome. It only took me a couple of hours to get it confirmed. All other Clear Striped Carps in their original condition, some might have had replacement rubs over time so these did not count, all turned out to have the striped pattern from the body crossing over the rub sign on the chest. So if those stripes were indeed applied after the stickers were put on the figures it actually meant that “regular” Clear Carps have been transformed into Clear Striped Carp and it was this exact realization that brought this weird myth, that has been hidden in my memory and shared above, back into reality. Those TAKARA employees and the Soy Sauce, could it really be……. ?